Colorless Winter Garden ? No Way! One of the many blessings of living in the desert is that you can garden all year. That means that you can have beautiful color all year, even in the winter (above). Drive down the street during the summer, and you will see flowering plants in the common areas and gracing the front yards of everywhere you look. Texas Sage, Bougainvillea, Lantana, and Tecoma species dot the landscape. Why then do people not include plants that will provide color in the winter? You can take the same drive as you did in the summer and see nothing but green blobs and nothing else (below). The landscape below is an unfortunate victim of ‘poodle’ pruning. We are so fortunate to live in an area with relatively mild winters, so why not take advantage of that fact in your garden? I mean, who thinks that this looks nice? Countless times, when I am meeting with clients, they ask, “My landscape is so boring. What can I do to make it look better?” The majority of the time, I hear this from winter residents. Their landscape is a riot of color in the summer when they are gone. But, in the winter when they are there, they have green blobs and little else. The landscape (above) has potential. The solution to a somewhat boring landscape is easy. Add winter-flowering plants to the landscape. When I create a landscape design for a brand new landscape, I make sure to include a variety of plants that flower at a different time of the year. This ensures year-round color. If you have an established landscape, add a few winter-flowering plants. That is all it takes. As you can tell, there are countless plants that you can use for winter color. If you are only a winter-resident, then you may choose only to have plants that flower in winter. As for me, I love lots of color year-round. My favorites are Purple Lilac Vine, Firecracker Penstemon, Valentine, and Angelita Daisy. Whether you live in the Tropics or Canada, this same principle is true for any climate you live in – make sure your garden provides color for you when you are there. 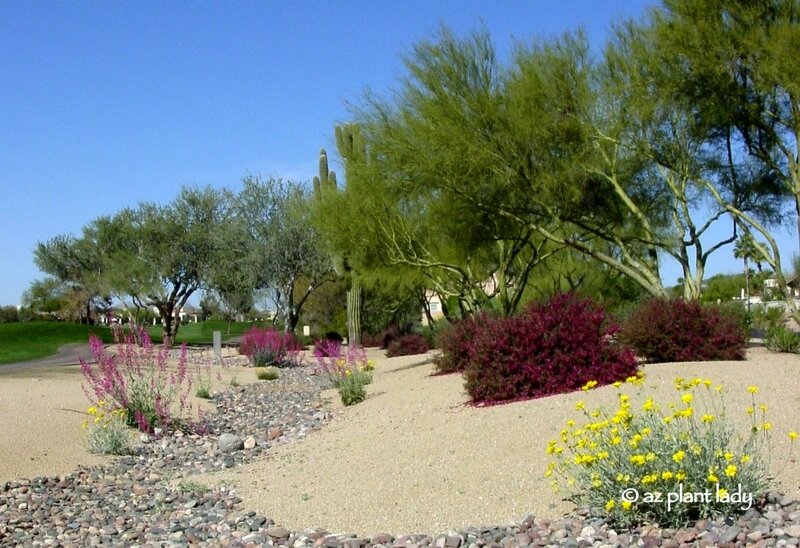 https://www.azplantlady.com/wp-content/uploads/2009/11/17-WW-cropped-picasa-edit.jpg 427 640 arizonaplantlady@gmail.com http://www.azplantlady.com/wp-content/uploads/2018/10/favicon.png arizonaplantlady@gmail.com2009-11-05 13:54:002019-03-11 18:10:05Colorless Winter Garden ? No Way! Has this happened to you? You walk through the nursery, and you spot “the perfect plant.” You can envision it in your yard and know precisely where you will put it. After coming home and planting it, you pat yourself on the back for finding such a great plant. Time passes, and your beautiful plant starts to grow, and grow and grow. Approximately 1 ft. Wide and tall. Fast forward a year or two now it looks bad unless you constantly prune making it high maintenance. Now your beautiful plant no longer looks so lovely (above and below). It now looks more like a ‘cupcake’ because you have had to prune it back to keep it small enough for your space. 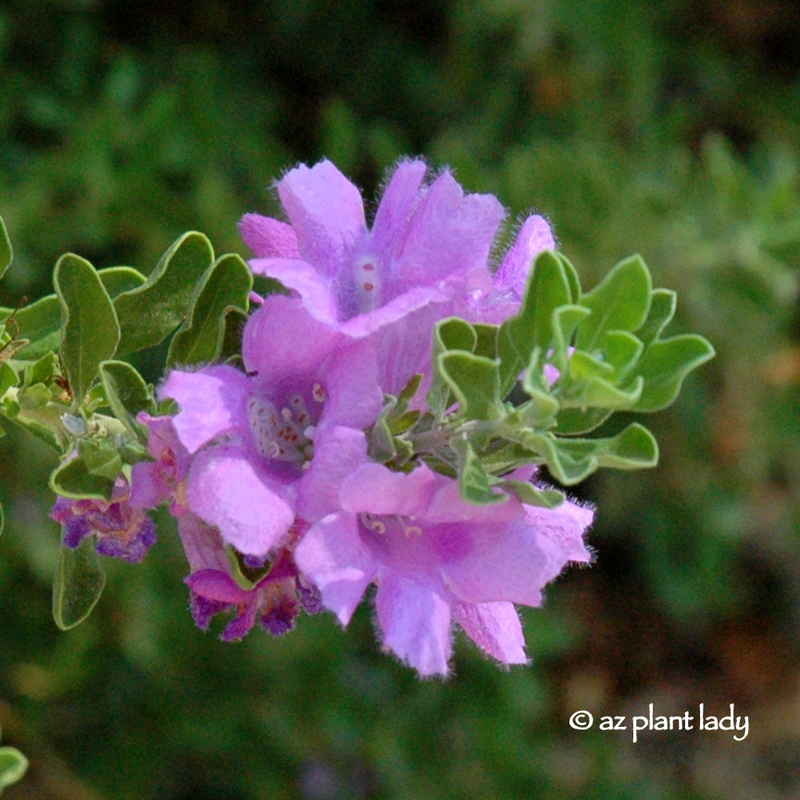 Texas Sage ‘Green Cloud’ in its natural shape. They can grow up to 8 ft. high and wide but can be easily maintained at a more moderate 4′ x 4′. Also with flowers this beautiful, why plant it somewhere where you will have to prune them off so that it can fit? So our lesson is…. be sure to READ THE LABEL of plants before you buy them, which should list how large they will grow, along with the correct sun exposure. If it’s not listed, ask the nursery salesperson for this information, or use your smartphone to get the information. Then you can go home and place your new “perfect plant” where they will have plenty of room to ‘stretch out’ and dazzle you with their beauty. 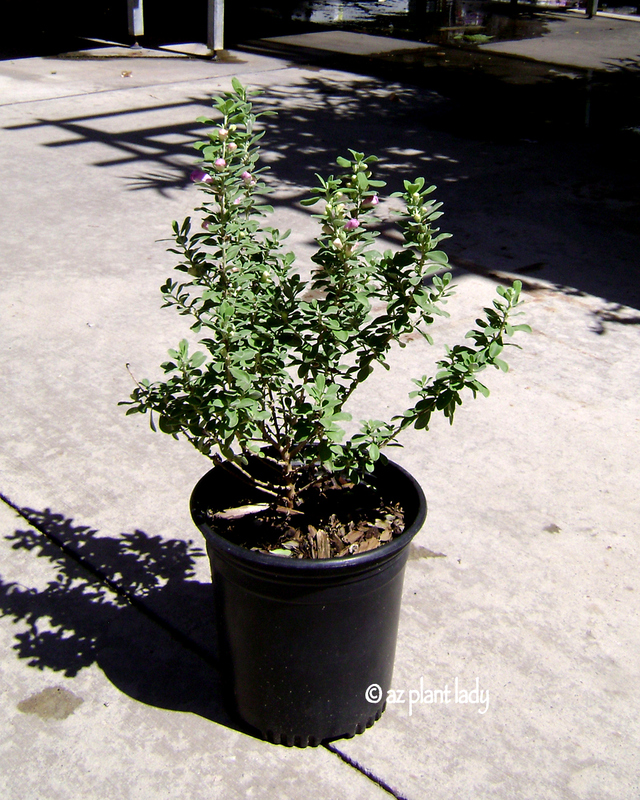 **Allowing enough room for plants is just part of what it takes to grow attractive shrubs. Pruning is the next part of the equation. Click here for guidelines on how to properly prune your flowering shrubs. Do you ever wonder what plants look good together? Below are pictures of some of my favorite plant combinations along with some general guidelines that I follow when designing a garden. Sometimes red and pink colors always compliment each other. Introducing yellow flowering plants provide a high color contrast that brings out the red and pink colors. 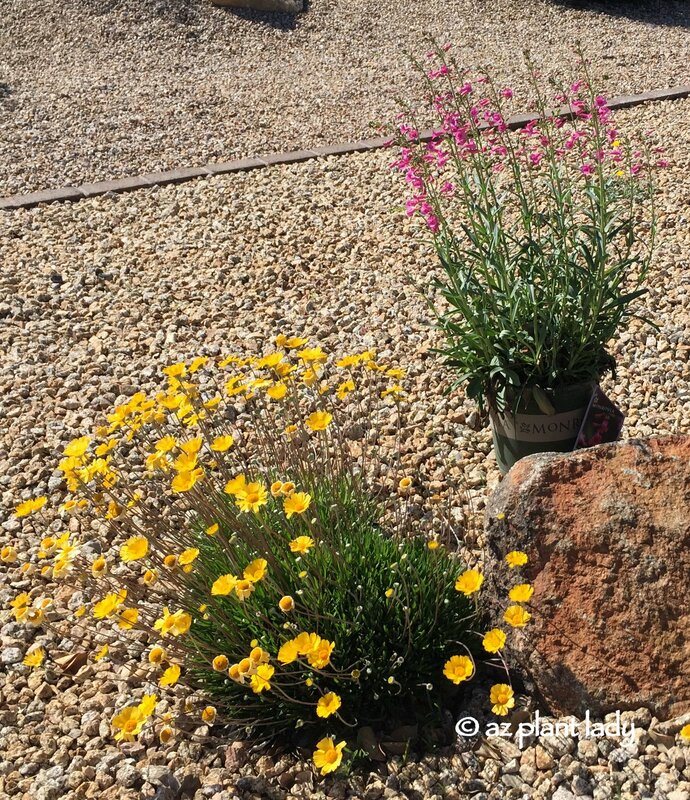 Above is a golf course landscape that I planted with Valentine shrub (Eremophila ‘Valentine’), Parry’s penstemon (Penstemon parryi) and desert marigold (Baileya multiradiata) against the backdrop of foothill palo verde trees. Also, succulents paired with perennials almost always compliment each other with their contrasting shades of green and textures. 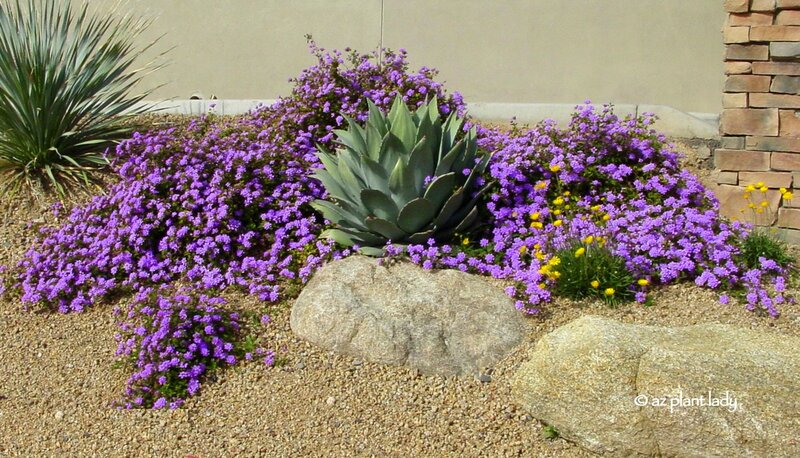 Other recommended succulent and perennial pairings include desert spoon (Dasylirion wheeleri) alongside black dalea (Dalea frutescens), prickly pear species with penstemon or try octopus agave (Agave vilmoriniana) with purple or white trailing lantana. I use plants with white flowers as a backdrop for plants with red, pink and purple flowers; I like the way the white flowers emphasize the other colors. 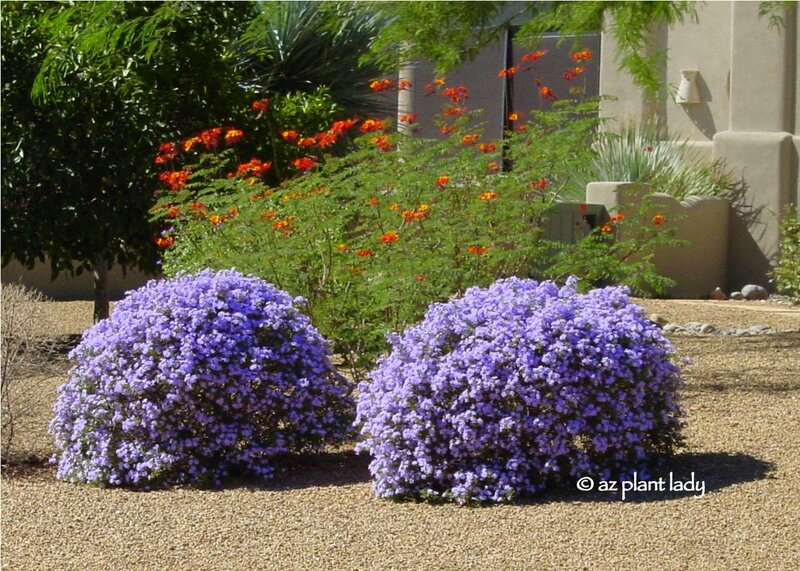 Most of the time the pairing of purple flowering plants with those that have orange flowers always looks great. When deciding what colors look good when paired together, it helps to look at a color wheel. In general, the colors that are opposite each other look great when paired together because their colors contrast so well. Other orange, purple plant combinations to try are cape honeysuckle (Tecomaria capensis) with (Leucophyllum species), or Mexican honeysuckle (Justicia spicigera) with purple lantana. Also, I believe that any garden looks better with some yellow flowering plants. As I mentioned earlier, the color yellow makes the other plants look better, (think of the color wheel). I have had clients that have said they do not like yellow until I show them how much better their other plants look when we introduce just a few yellow flowering plants to their landscape and they quickly change their mind. I often recommend the following for those who are looking for large shrub combinations. Okay, I realize that many people either love or hate bougainvillea. Personally, I love them. I have two bougainvilleas and since I don’t have a swimming pool, so I am not bothered by their litter. Their beautiful and vibrant colors are amazing. I pair my bougainvillea with yellow bell shrubs. Their colors contrast nicely, and they screen out the back wall of my garden. I give them plenty of room to grow, and they produce beautiful flowers spring through fall. If you do have a swimming pool and don’t like bougainvillea, how about trying orange jubilee (Tecoma hybrid ‘Orange Jubilee’) and Texas Sage (Leucophyllum frutescens) together? I have just one more tip – if you want to pair flowering plants together to enjoy the contrasting colors, make sure that they bloom at the same time of year. It is so easy to visit the plant nursery and see the pretty photos of flowers on the different plants and pick what ones you think will look great together only to discover later that one flower in the fall while the other blooms in spring and so you never see their flowers at the same time. So, visit your local nursery and try some of the suggested plant combinations or see what beautiful plant pairings you come up with for your garden. When people think of the Sonoran desert, hillsides studded with saguaro cactus and cholla often come to mind. But interspersed between the cactus, you will find the iconic palo verde trees with their beautiful green trunks and branches. The word “Palo Verde” means “green stick” in Spanish, referring to their green trunk, which is a survival mechanism in response to drought. Palo verde trees are “drought deciduous,” which means that they will drop their leaves in response to a drought situation. Their green trunks and branches can carry on photosynthesis, even in the absence of leaves. Palo verde trees act as a “nurse plant” to young saguaro cacti by protecting them from the cold in the winter and from the intense sun in the summer. Beautiful, yellow flowers are the product in the spring. Another species of palo verde that is prevalent in the landscape are called palo brea (Parkinsonia praecox), formerly (Cercidium praecox). They have a dusty green trunk and branches that twist and turn. 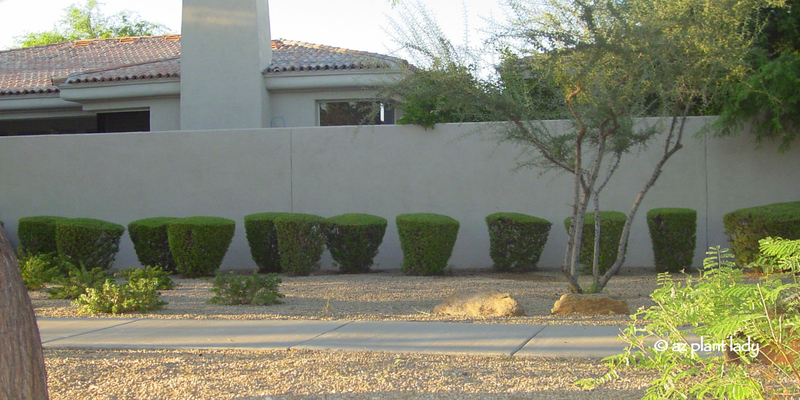 Their cold hardiness range is around 15 to 20 degrees F.
PALO VERDE USES: Palo verde trees serve as beautiful specimen trees where their green trunks, branch structure, and flowers serve as an attractive focal point in the landscape. 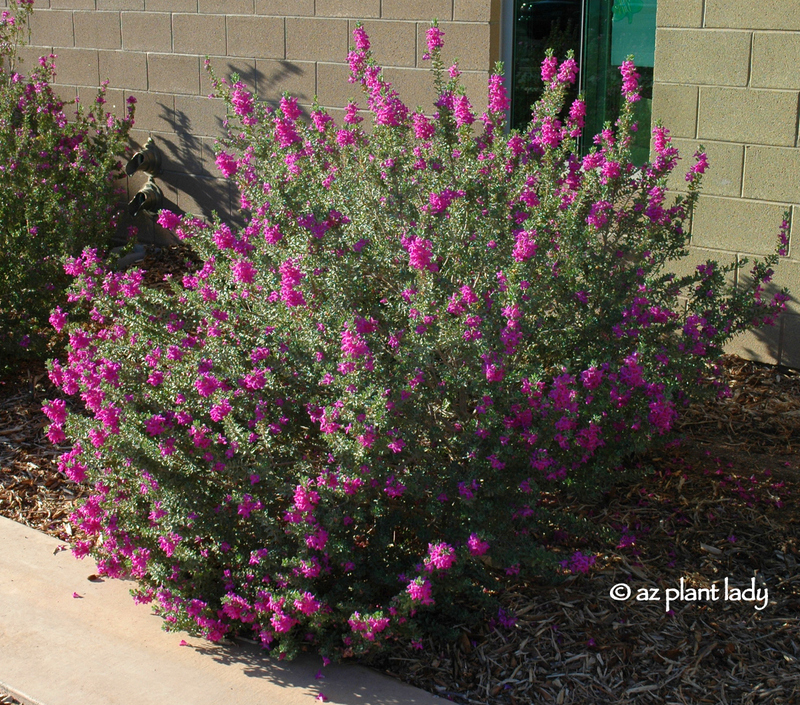 They are drought tolerant, once established and provide lovely filtered shade year-round. When deciding where to place your tree, be sure to take into account that they need a lot of room to grow, mature sizes are listed below. Palo Verdes don’t do well when planted in grass and will decline over time. Locate away from swimming pools due to flower litter in the spring. Because of their more massive thorns and branching tendency to point downwards, palo brea trees aren’t recommended in areas close to foot traffic. As with many desert trees, Palo Verde trees have thorns, except for the ‘Desert Museum’ Palo Verde. 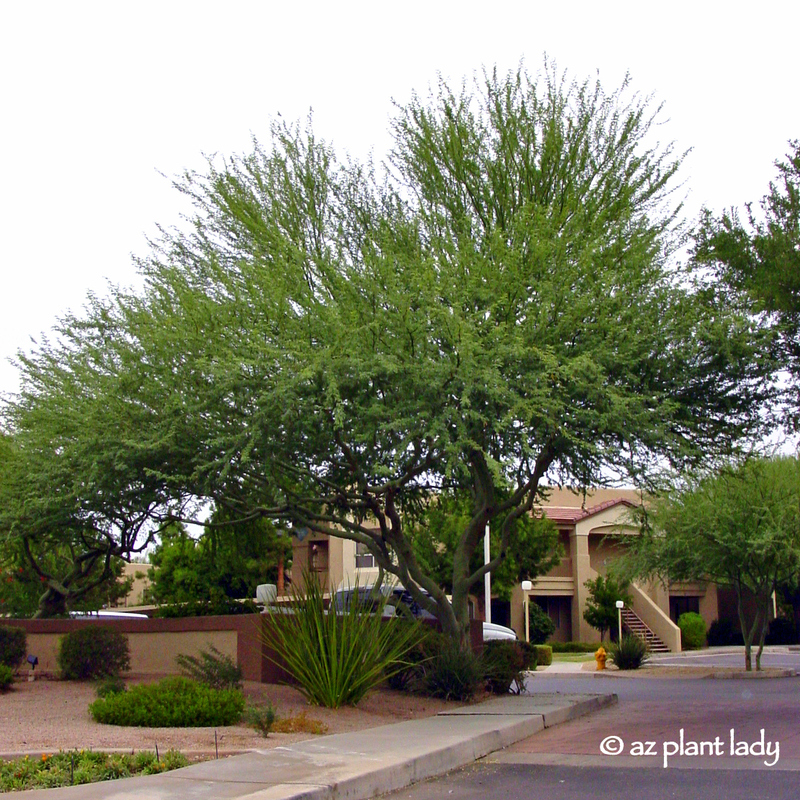 PALO VERDE MAINTENANCE: Prune to elevate the canopy and maintain good structure. Avoid hedging and “topping” trees as this stimulates excess, weak growth. MY FAVORITE: As a landscape manager, horticulturist and arborist, I have grown and maintained all of the palo verde species mentioned, and I truly enjoy them all. However, at home, I have 4 ‘Desert Museum’ trees. In comparison to the other species, their trunks are a deeper green; they produce larger flowers, are thornless and grow very quickly in the desert. Also, they require little, if any, tree staking when planted.